Sorry, I've been having major blogger block! I'm going to get back on it, I promise! So I finally got a Cambridge Satchel! I got this patent leather one from Asos.com (it's an exclusive to Asos). It was more expensive than some of the others, but I had it in my bookmarks for a few weeks and then on Leap Day there was 10% off, so I decided I would treat myself. 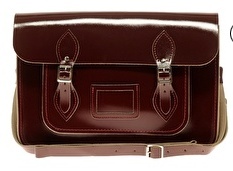 Asos.com describe the colour as 'oxblood' and I have to say it's a gorgeous rich dark red. I have a weakness for patent leather, especially in rich colours like burgundy, dark purple, dark green, and navy. I wear a lot of navy, so I think this bag will go nicely with most of my clothes! I haven't worn it yet, but I can't wait! It looks beautiful! Well, maybe not. Has the solar storm affected you? Yeah, apparently there's a solar storm going on out there which means it should be even easier to see the Aurora Borealis and Aurora Australis than usual! Has anyone seen any aurora?!? I haven't, but I have listened to Planetarium by Otsuka Ai (大塚 愛) recently. Maybe you know it too, it was an insert song in the Japanese drama Hana Yori Dango (花より男子) which was pretty popular! That's a beautiful bag. I love the colour and finish of the leather. And yes, I have seen the Northern Lights. Years ago when I lived in Labrador. Lucky! I would love to see them! I think I might have seen some when flying once, but I'm not sure if it was really aurora or not. Just saw on BBC apparently we'll be able to see 5 planets in one night this week! (Mercury, Venus, Mars, Jupiter, and Saturn!) So exciting! Hi there! I'm just about to buy this bag in the 11" but can you pretty please tell me which is a more accurate depiction of the colour – dark brown (ASOS image) or a deep red (ShopBop)? Hi! I bought mine from Asos and it was described as 'oxblood' and is definitely a dark red - burgundy colour. The Asos image looks dark red/burgundy to me tho, so maybe your monitor settings are different than mine. I hope you get the colour you're after!